If you are a big online shopper, you may not be bothered by finding Search.youronlineshoppingnow.com in your browser upon opening it. But we are here to tell you why this questionable search engine may be risky to have and to hold on to. As a matter of fact, its presence clearly shows that a browser hijacker has sneaked onto your computer. Although this search page may mesmerize you with its changing full-page backgrounds, you need to be aware of the potential risks of having such an unreliable tool in your browsers. This browser hijacker may affect all your major browsers, including Mozilla Firefox, Google Chrome, and Internet Explorer as well; therefore, there is almost no way you can escape the exposure to its content. We do not recommend that you engage with this search engine in anyway. In fact, we recommend that you remove Search.youronlineshoppingnow.com right now before you become exposed to potentially unsafe third-party content. We have noticed that this browser hijacker mainly targets the US region. However, since this hijacker uses questionable methods for spreading over the net, including freeware bundles, we can assume that you can get infected by it anywhere in the world. Bundles can be quite dangerous since they may hold several malicious software installers. If you allow the content of such a package onto your machine, soon your browser experience may turn into a nightmare because of the potentially harmful third-party ads and search engines like this promoted by browser hijackers. You can easily download such bundles if you end up on shady file-sharing websites, such as shareware and torrent sites. These pages can host a number of third-party advertisements, which can be quite deceiving at times. Clicking on such ads may result in downloading infectious bundles. It is also possible that you simply click on a third-party ad that is displayed by an adware program, such as InteliTerm and TermTrident, which is there on your computer. This means, of course, that your PC was infiltrated by malware before. That is why you need to be very careful with clicking on ads because if there is a single adware infection on your computer, third-party ads may be quite risky to click on even when you think you are safe on a legitimate website. Since there is a good chance that your computer has been infected with adware programs as well, we advise you to scan your system for malware after you remove Search.youronlineshoppingnow.com. We have found that this useless search engine is actually identical to Search.searchlttrn.com and Search.yourpackagesnow.com among others. Well, the only difference may be that this search page has various backgrounds every time you reload the page. The usual fake toolbar is also missing from the top but it is still the same search engine. We have noticed that Search.youronlineshoppingnow.com will be set as new home page and new tab page for Internet Explorer and Mozilla Firefox, which instantly redirects to Search2.youronlineshoppingnow.com; and, home.youronlineshoppingnow.com will be set in Google Chrome. Apart from the usual questionable search box, there are a few easy-access links to shopping-related sites right below it, such as Groupon, Yahoo Shopping, and Walmart. However, be aware that going through this hijacker might mean that you will be shown targeted third-party ads on these sites. This is also true for the search as well. 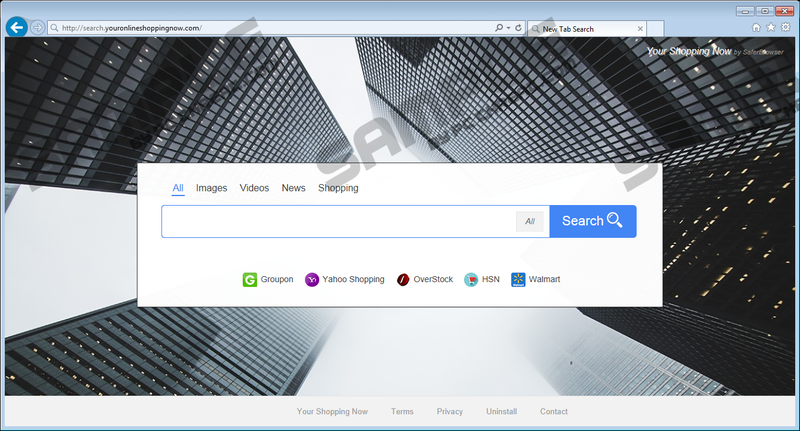 Unfortunately, this hijacker redirects all your searches to a possibly modified Yahoo search results page that may contain potentially harmful third-party advertising and sponsored links as well. Clicking on these potentially unsafe links may reroute you to malicious websites. We recommend that you delete Search.youronlineshoppingnow.com if you do not want to become a victim of online scams. In order to stop this threat source, you need to do two things. Although this browser hijacker does have an uninstaller, unfortunately, it does not work properly. So even if you run it, only Internet Explorer will be dealt with. The remaining two browsers, Mozilla Firefox and Google Chrome need to be taken care of manually. This means that you need to reset these browsers yourself if you want to make sure that this hijacker is gone without a trace. Please use our guide below if you are unfamiliar with the required steps. Also, keep in mind that you can do a lot for the protection of your PC if you regularly update all your drivers and programs, including your browsers. By doing so you make sure that the vulnerability of your system is lowered and your exposure to the tricks of cyber criminals is also more controlled. If you are looking for proper protection, though, we advise you to implement a professional malware removal tool that can save you a lot of headaches that come with successful malware attacks. Tap Win+X and pick Programs and Features. Click on the application and click Uninstall. Access the Start menu and choose Control Panel. Click on the application and click Remove. Press Refresh Firefox and click Refresh Firefox again. Tap Alt+F and choose Settings. Scroll down and click Reset settings. Click Reset in the pop-up. Quick & tested solution for Search.youronlineshoppingnow.com removal.